Relations between Scotland and its larger neighbour to the south, England, have from time to time been difficult. Sometimes they still are - these days through the politics of Independence, Brexit and much more. This is nothing new. Here’s a true story from long ago, when the wrecking of the English vessel Edward Bonaventure caused a diplomatic incident between the two nations - and especially involved Russia as well. On the Moray Firth edge of North-East Scotland, between Fraserburgh (at the very tip) and the village of Rosehearty to the west, there is a rugged shore. Long rocky platforms run into the sea and are open to all the northerly winds. Along this stretch of bare coastline, the old settlements of Sandhaven and Pitullie crouch by the sea-edge. At this point, the Rosehearty main road separates beach from pasture or salty marram grass. Dedicated birdwatchers might stop, but many visitors hurry by, glancing at the gaunt hulk of Pittulie Castle across the fields. Looking west from Kinnaird Head, Fraserburgh, on the very tip of Aberdeenshire. Broadsea in middle distance, with, further off, Sandhaven. Troup Head on horizon. Picture taken in November, the same time of year that the Edward Bonaventure came ashore. Now they have gone, ground into driftwood and splinters by the winter storms, an eerie re-enactment of the shipwrecks of long ago. England was a long way south in the 16th century - the news of the shipwreck took 26 days to reach the English capital. The bare and (frankly) undistinguished shores here do not seem a likely setting for events of international consequence. Yet for a little while, in 1566, during the reign of Mary, Queen of Scots, this coastal stretch became the focus of diplomatic attention from three nations : Scotland, England and Russia. Somewhere among the treacherous reefs here a ship was lost, along with much of its cargo; valuable both in political and monetary terms. Kinnaird Head Lighthouse in Fraserburgh, now the Museum of Scottish Lighthouses. Fraserburgh, at the time a huddle of tiny crofts and known as Faithlie, certainly knew about storms and shipwrecks. Scotland's first lighthouse authorised by the Northern Lighthouse Trustees was to be lit here in 1787 at Kinnaird Head. Thomas Smith, whose young assistant was Robert Stevenson, progenitor of the famous Stevenson family of lighthouse builders, chose Sir Alexander Fraser's tower house (built 1570) as a base for the light. Today, it is the Museum of Scottish Lighthouses. It marks the turning point of the Moray Firth, known to the Romans and marked on the Egyptian cartographer Ptolemy's map as Promontorium Taizalium, the headland of the Taezali, the local Pictish tribe. But it was in Broadsea, the picturesque sea-town of Fraserburgh in the shadow of Kinnaird Head, that old seafaring men used to tell of a rich cargo that had once come ashore on the coast nearby - of how furs, silks and jewels were scattered along the rocks. The tale starts in another country - England. During the first year of the reign of Queen Mary Tudor (known as 'Bloody Mary', though not for her liking of vodka and tomato juice), the Governor, Consuls and Company of English Merchants in the far-off London of 1553, planned a great expedition ‘for the discovery of regions, dominions, islands and places unknown’. They were entrepreneurs, eager to trade and especially interested in a north-east passage to India. They appointed the English explorer Sir Hugh Willoughby as the expedition commander. The expedition of three ships sailed from Deptford, London, England, on May 10th and by September two of them, the Bona Esperanza and the Confidentia, had reached Russian Lapland. The third ship was the Edward Bonaventure, commanded by the pilot-general of the expedition, Richard Chancellor (Chancelour), an experienced English seaman. Having been separated by a storm near the Lofoten Islands, his vessel reached the White Sea, where his overwintering proved more successful. When the ice melted, the two other vessels were somehow found and brought round to link up with Chancellor. He in turn visited Moscow at the invitation of the Tsar - Emperor of All Russia, Ivan Vasilivich (‘Ivan the Terrible’). It was arranged that the English vessels would lie at St Nicholas on the White Sea till he returned with crews for them. The Edward Bonaventure then sailed to England. Another November day, but this time a bright one with only a moderate sea running. This is west of Rosehearty. (We always referred to this stretch as ‘The West Rocks’.) Troup Head on horizon, right. Another expedition was financed by the prosperous London merchants . With extra men on board, an additional vessel, the Philip and Mary, accompanied Chancellor's ship on the hazardous journey beyond the Arctic Circle once more. They arrived at St Nicholas safely and all was made ready for the return of the fleet of four vessels. This was both a diplomatic mission and a commercial exercise intended to stimulate trade. Since the expeditions had made contact at high level with the eager-to-trade Russian state, their Russian hosts cooperatively loaded costly wares aboard: including sables and other furs as presents for King Philip and Queen Mary of England. The Emperor also sent a certain Osep Napea as his Ambassador and Orator. He was the first Russian Ambassador ever to reach England, though he took a circuitous route, as events soon proved. ‘The West Rocks.’ This off-the-beaten-track stretch of coast on a calm summer day. Note Quarry Head with white hut - once an observation place for the former RAF bombing range that was located very near the Bonaventure wreck site. The fleet left the White Sea in favourable conditions, but later encountered a fierce gale which scattered them over the North Sea. The Philip and Mary arrived safely after a nine month crossing. The Bona Esperanza was never seen again, while the Confidentia was lost with all hands on the Norwegian coast. Four months after setting out, on the 10th November 1556, the Edward Bonaventure, with Chancellor and the precious Ambassador, sighted the long white line of surf that marked the reefs and rocky shoals of the treacherous coast near Rosehearty. A fierce on-shore wind was blowing. Chancellor tried to anchor but the ship was soon 'beaten from her ground tackles’. 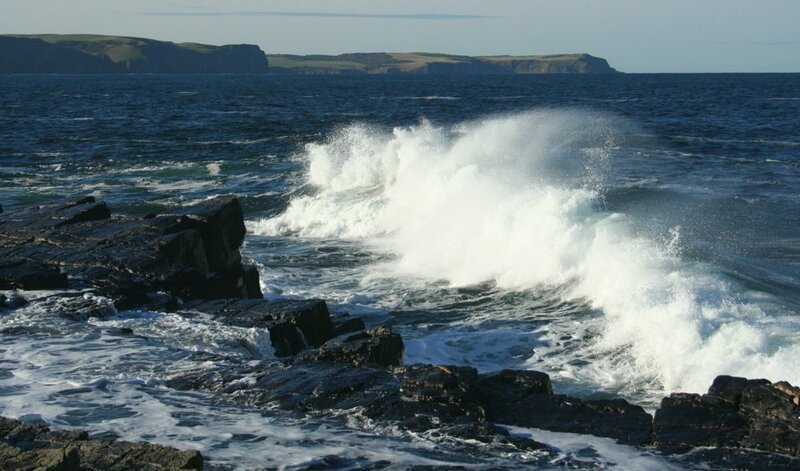 Nothing could withstand the force of the waves which thunder up this shore in a northerly gale. As darkness came down the vessel grounded and fell on her side. With the hull breaking up, the pilot-general bundled the Ambassador and a few of his attendants into the ship's boat. This too was overwhelmed in the surf of the ‘outrageous tempest'. Chancellor was drowned along with most of his crew - including his own son. By a miracle, Osep Napea and a handful of others struggled ashore. Looking east to the village of Rosehearty. The odd-looking tower-like building was an observation tower built shortly before the bombing range here was closed. It is now a private house. The Russian Ambassador is saved! That this most important personage survived was certainly fortunate. At least Queen Mary down in England did not have to explain to the Emperor of Russia that she had lost the Ambassador. Back in Scotland, though the locals were hospitable, language difficulties made the situation awkward. It is not recorded what Napea made of the good Scots tongue which still survives here in all its colour and vigour today. It is known that news of his misfortune took twenty-six days to reach the English court, arriving there on the 6th December. However, these English merchants were clearly heavyweights and were able to pull strings. Queen Mary of England asked her namesake in Scotland to intervene. The Lords of the Council of Scotland were contacted. The English Court sent ' two gentlemen of good learning, gravitie and estimation. . . Lawrence Hussie, Doctor of the Civil Lawe, and George Gilpin with money and other requisites into the realm of Scotland to comfort, ayde, assist and relieve' the stranded ambassador. An interpreter was also sent. Clearly, the Scots were not trusted to attend to the needs of their unexpected guest. Where is the Edward Bonaventure's cargo? The welcoming party from England arrived in Edinburgh on the 23rd December. They found the Ambassador had arrived there before them, having received much help and sympathy from the Scottish Court. Unhappily, Napea related that he had none of the valuable cargo of the vessel with him. Everything had vanished. This was a source of great embarrassment to the English - that an ambassador should be shipwrecked was bad enough, but that he should have all of his property stolen (the implication was clear) was even worse. Hussie and Gilpin, the English diplomats , were well received by Mary, Queen of Scots. Impressive arrangements were made to try to recover the Russian 'goods, apparell, jewels and letters’. The Scottish Queen Mary sent 'certain Commissioners with an Herald of Armes' to the scene of the wreck which is recorded by the English geographer Richard Hakluyt as being at the ' Bay of Pettislego' (Pitsligo). This might place it between Quarry Head and Rosehearty on today’s maps - but nobody knows for sure. There were no harbours in those days on this stretch of coast. Certainly, there was a settlement at Rosehearty. According to local tradition, a party of Danes shipwrecked in the 14th century had stayed on to teach the local crofters fishing skills. Obviously, fishing was a fair weather occupation and in the short and stormy winter days, the local folk would have been eager for any means to supplement their meagre income. In their knuckle of land beyond the Grampians, far from authority, they would know little about the law. On a coastline on which wrecks inevitably occurred, any spoils that came ashore would have been fair game. In the dark days of winter, perhaps the Queen's representatives rode from Kinnaird Head - even then crowned by the Wine Tower, now Fraserburgh's oldest building - to the the Castle of Dundarg on its crumbly red sandstone headland near New Aberdour. Perhaps the Bonaventure came ashore further west still. 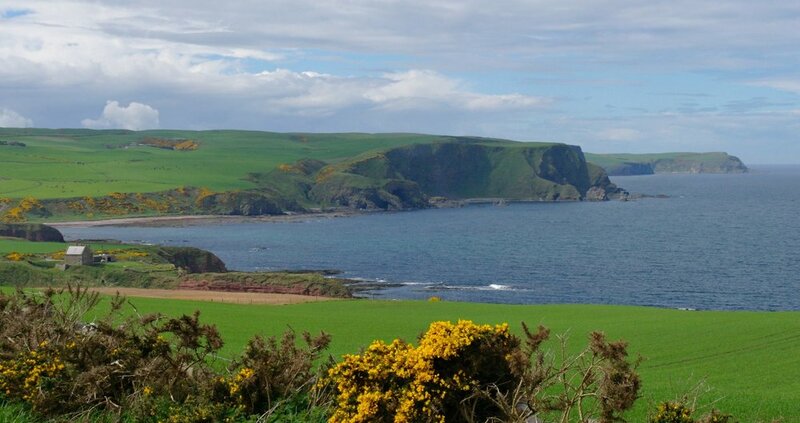 The coastline becomes increasingly rugged here, towards Pennan and Troup Head. The former site of the ancient Castle of Dundarg (from Gaelic ‘red fort’) is the nearer reddish headland above and left of the yellow flowering gorse. Note that the edict mentioned the degree of person. It is unlikely that a humble fisher in those days would be able to stroll around unnoticed with a sable cloak, or that this wife should suddenly be deck herself with jewellery. Today it’s different and expensive clothes and jewellery are de rigeur for most fishing skippers’ wives hereabouts! No, the finger should be pointed at the well-to-do of the neighbourhood. Who can say what took place at the back door of the tower houses of the upcountry lairds? After investigations, no less than 180 names were noted during the northern foray by the Scottish Queen's representatives. They were summoned to appear in Edinburgh, before the Queen herself. None ever did - or at least the records are silent on this matter. In fact, in Hakluyt's account of the affair he rather suggests that even the Scottish Commissioners connived to swick the English out of the costly wares. Certainly, Osep Napea left Edinburgh for London on the 14th February 1557, having given up hope of seeing his property ever again, thanks to the Scots and their 'subtile and crafty dealings'. A note written in London, then as now England’s capital, in May of 1557 is full of self-righteous moral indignation over the whole business. The ambassador was ‘unreverently abused, the goods spoiled and deteined', and that not until the Russian guest was taken to England was effective repair made. In fact, the memo - doubtless exaggerated - emphasises the proper due reverence shown by England and how it contrasted with the rough handling north of the Border. Clearly relations between the two nations were a little strained at the time! Where is the wreck of the Edward Bonaventure? The exact wreck site is now unknown. In Chambers ‘Book of Days' it is given as near Kinnaird Head, that is, right at the tip of the Moray Firth, while Richard Hakluyt, writing at the end of the 16th century, mentions Pitsligo Bay. Equally well, it could have been further west. There have been some searches for the Bonaventure shipwreck made in recent years but nothing definite has ever been found. In conclusion: the Russian Emperor certainly had a lavish style. In the inventory of missing goods is four 'living sables' with chains and collars. Other livestock on the present list was a ‘white jerfawcon’ (gyrfalcon) - a prestigious gift for the falconers of the English Court, along with a drum of silver used as a lure. The mink and the great white bird probably perished. Perhaps the silver drum still rolls around the reefs and rocks of Pitsligo Bay. Or possibly some old Aberdeenshire family still has some curious Russian silverware locked away amongst its baubles and heirlooms.